We briefly mentioned in a previous article how much we were pleased about the positive feedback shared by the community and the press. Indeed, with a very good 84 Metacritic score, Steel Division: Normandy 44 is generally seen as a refreshing and challenging Tactical RTS. We would like to share with you some of the reviews we read on the web, from the general spirit of the game to more specific features. We hope this little press review will help new players make their choice and land in Normandy with us! 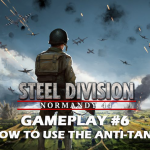 Many reviews recognize Eugen Systems’s “touch” for RTS but also emphasize the specific additions to Steel Division: Normandy 44 in terms of gameplay, graphics, and historical details. At Eugen Systems, we are proud to have created an innovative game, without resting on our laurels. Our art team has always been committed to delivering the best-looking game possible. Thanks to our IrisZoom we’ve been able to highlight the Normandy’s distinctive landscapes and we’re pleased to read that our game is found visually attractive! It was essential to capture the unique spirit of the Normandy campaign, a legacy that many of us in the studio shared. We are proud to see that the authenticity of WW2, through the historic accuracy and Steel Division’s own atmosphere, is well-received. With more than 400 units meticulously transcribed, players feel like a commander in battle, directing their customized battlegroups in the “Hedgerow Hell”. The frontline is a winning bet, a visual signature and an effective gameplay feature, described as “Eugen’s best trick” by PC Games N. Other features such as the 3-Phase system or the suppression mechanic also change the way players apprehend the game. 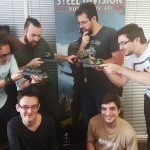 With Steel Division: Normandy 44, we wanted to make a game enjoyable for different types of player: solo players, multi-ranked aficionados, RTS pro-gamers but also for the new Cadets not familiar with this kind of game. All of these positive feedback were very rewarding, but negative ones, both from the press and the community, were also very helpful. We will always do our best to deliver the most enjoyable game, and every review helps us in this process! We are still working day after day on Steel Division: Normandy 44 to improve the stability and the balance, dedicated to providing a fulfilling and challenging experience.